He puts his life on the line to protect the Democratic Republic of Congo’s national parks, the dedicated conservationist and winner of the 2017 Goldman Environmental Prize. A UNESCO World Heritage Site, Virunga is the oldest national park in Africa, 768,000 hectares containing extraordinary biodiversity and beauty. It is home to a quarter of the world’s critically endangered mountain gorillas, as well as other endangered species, including chimpanzees, elephants and lions. ‘Since I was a boy, I wanted to be a public servant: I don’t like illegality and corruption. And I wanted to conserve Congo’s natural heritage,’ says Katembo. However, things could have turned out very differently: in his early teens, he was lured into the Congolese army with the promise of studies in Europe and served four years as a child soldier. But once he left, he returned to school, determined to make up for lost time. He studied ecology and natural resources management, and became a park ranger at Virunga in 2003. He quickly earned a reputation for integrity and exceptional leadership in this challenging environment. Despite its importance, Virunga has been ground zero for the DRC’s military conflicts. The park is also under constant threat from illegal mining, armed rebels and wildlife poaching, making patrolling Virunga one of the most dangerous jobs in conservation. More than 160 of Katembo’s park ranger colleagues have been killed in the line of duty over the past 15 years. At Virunga, Katembo quickly rose up the ranks and became warden of the park’s central sector – an area of interest to oil companies. When vehicles from the British oil company Soco International drove into Virunga one morning in 2011, Katembo was alarmed. Soco staff flashed permits, which the Congolese government had sold them illegally, and offered him money to let them pass. But he refused and reported the incident to the park director, Emmanuel de Mérode. They agreed that it was vital to document carefully evidence of corruption. Over the next four years, Katembo went undercover, pretending to accept bribes from Soco and recording these encounters. His investigation exposed corruption at the highest levels and forced Soco to abandon oil exploration in the park. The footage Katembo gathered featured in the documentary film Virunga (Netflix 2014). ‘Corruption stories like this happen all too often, but capturing people incriminating themselves on camera is incredibly rare,’ says Nathaniel Dyer, Global Witness Congo team leader. ‘Rodrigue showed great courage and nerve to provide incontrovertible evidence which was central to getting Soco out of Virunga.’ But Katembo paid an enormous price for his activism: he was taken at gunpoint by Congolese soldiers and detained illegally for 17 days during which time he was tortured and subjected to mock executions. 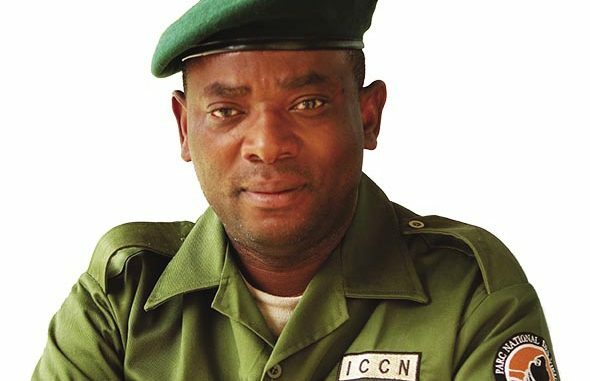 Following death threats and the failed assassination of de Mérode in 2014, Katembo was transferred to Upemba National Park in southern DRC, for his safety. As the new director, Katembo has been trying to reintroduce elephants and zebras, which had disappeared as a result of mining and poaching on a massive scale. Since starting work at Upemba, Katembo has fought off armed militia, faced death threats and refused to accept bribes from mining companies. He now lives apart from his wife and children for their safety. In recognition of his bravery exposing illegal oil exploration in Virunga National Park, Katembo was awarded the 2017 Goldman Environmental Prize for Africa – a type of Nobel for environmental activists.